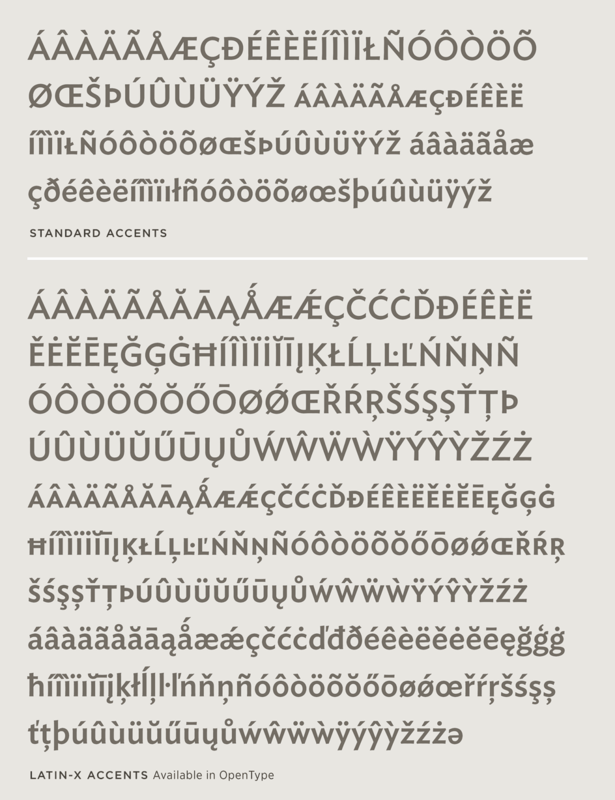 Ideal Sans Font Features: Language Support | Hoefler & Co. Most fonts contain the accents necessary to accommodate the major Western European languages, at the expense of the rest of the world. Type foundries have traditionally addressed these absences on an ad hoc basis, creating one-off variants like “CE” (Central European) which might handle Polish, Czech, Hungarian, or Romanian — but not necessarily all of them. Often ignored were major languages like Turkish, with fifty million speakers, and "minor" ones like Catalan — a language commonly neglected, yet more widely spoken than Danish. Unlike legacy formats such as PostScript and TrueType, OpenType fonts are virtually limitless in the number of characters they can contain. In preparation for moving its library into OpenType, Hoefler & Co. established the Language Research Program in 2005, in order to develop updated specifications for its Latin-based character sets. The initial product of this research is our Latin-X™ character set, which expands the reach of a typeface to an additional 200,000,000 readers worldwide. This character set reflects not only a more accurate awareness of the political landscape of language, but the most up-to-date understanding of cultural norms. The Latin-X™ character set covers Afaan Oromo, Afrikaans, Albanian, Alsatian, Aragonese, Arapaho, Arrernte, Asturian, Aymara, Basque, Bislama, Blackfoot, Bosnian, Breton, Catalan, Cebuano, Chamorro, Cheyenne, Cimbrian, Corsican, Croatian, Czech, Dalecarlian, Danish, Dutch, English, Estonian, Faroese, Fijian, Filipino, Finnish, French, Frisian, Friulian, Galician, Gallegan, Genoese, German, Glosa, Guarani, Haitian Creole, Hawaiian, Hiligaynon, Hmong Daw, Hopi, Hungarian, Ibanag, Icelandic, Ilokano, Indonesian, Interlingua, Irish, Irish Gaelic, Istro-Romanian, Italian, Japanese transliteration, Jèrriais, Kapampangan, Kashubian, Kiribati, Koongo, Korean transliteration, Kurdish, Ladin (Gardena), Ladin (Valle di Badia), Languedocien, Latin, Latvian, Lithuanian, Lojban, Lombard, Low Saxon, Lower Sorbian, Luxembourgeois, Macedo-Romanian, Malagasy, Malay (Latinized), Maltese, Manx, Maori, Marshallese, Megleno-Romanian, Míkmaq, Mohawk, Montenegrin (Latinized), Náhuatl, Naxi (Latinized), Norfolk/Pitcairnese, Norwegian, Nyanja, Occitan, Oromo, Pangasinan, Papiamento, Pedi, Piedmontese, Polish, Portuguese, Potawatomi, Quechua, Romanian, Romansch, Rotokas, Rundi, Saint Lucia Creole, Inari Sami, Lule Sami, Samoan, Sardinian, Scots Gaelic, Serbian (Latinized), Seychelles Creole, Shona, Sicilian, Slovak, Slovene, Somali, Sorbian, South Ndebele, Southern Sotho, Spanish, Swahili, Swati, Swedish, Tagalog, Tahitian, Tausug, Tetum, Tok Pisin, Tongan, Tswana, Turkish, Turkmen (Latinized), Tuvalu, Upper Sorbian, Uyghur (Latinized), Veps, Volapük, Votic, Walloon, Walpiri, Welsh, Xhosa, Zhuang, and Zulu.